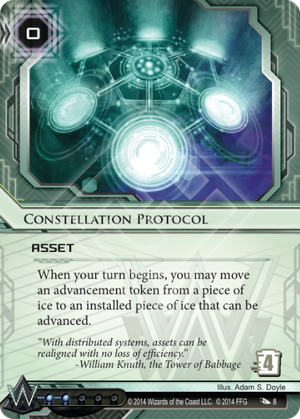 When your turn begins, you may move an advancement token from a piece of ice to an installed piece of ice that can be advanced. A trash cost of 4 and a rez cost of 0 means this asset likely needs no protection. Being able to move advancement counters from rezed "space" ice to any other ice that can use the tokens seems the main idea behind this card. Other uses include (but may not be limited to) Stacking counters on a single ICE in preparation of Commercialisation. Moving from any generic ice to ice that can be advanced in Tennin, Getting value of the counters on a large icewall recently femmed. Moving counters from servers that are not under pressure to more critical areas. So there's a lot to do with this card, and it will be interesting to see how often it will make the cut. Very nice casual card at least.